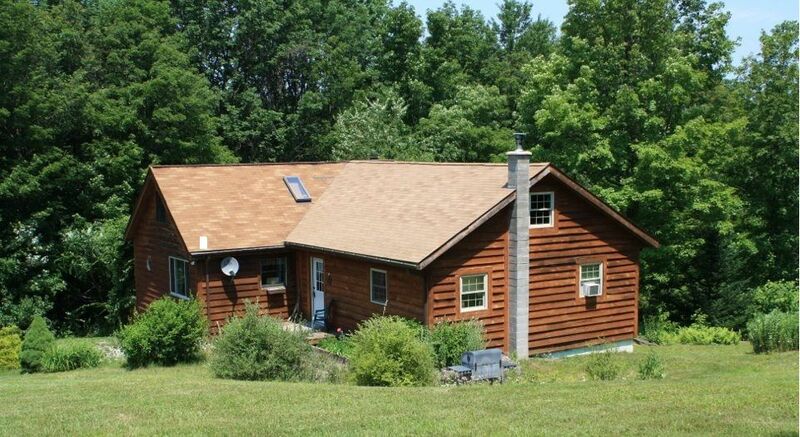 Beautiful well-appointed private cabin sitting on almost 15 private acres. WELCOME TO " OFF THE BEATEN PATH"
A beautiful home located in the Pennsylvania Wilds on 15 private acres. You will love the privacy of this home. Nestled up a private lane, with absolutely no view of traffic, with no other cabins in sight . Check out the 5 star reviews from previous guests. queen log bed in the master bedroom and the other bedroom has a double log bed and a twin log bed. Every room has a ceiling fan, and air conditioning in summer months if needed. Two full bathrooms in the home. One has a beautiful cast iron soaking tub. We provide all the bath towels, hand towels and wash clothes. Soft soap in bear dispensers in each of the bathrooms, so no need to pack hand soap, we will have it there for you! The kitchen has everything you might need - dishes, utensils, pots, pans, toaster, mixer, blender, full refrigerator, stove, microwave and coffee maker. Dish towels and cloths are in the drawers. Seating for 8 at the table. Plastic wraps and foil are usually there also. Linens and towels are supplied, plus a washer and dryer. We also provide paper products enough to get you started. So much fun can be had, by roasting s'mores by the fire pit, or talking a walk through the woods enjoying the sounds of nature. Enjoy dinner sitting outside on the picnic table after a beautiful day spent in historic Wellsboro or hiking the Grand Canyon. We have an extensive DVD library and plenty of books to read. Toys,games,and puzzles for all! morning coffee or afternoon glass of ice tea. Watch the hummingbirds at the feeder. You will love the outdoors and beautiful grounds that surround this cabin. The cabin has WiFi and Dish for the 2 televisions. We hope you will enjoy our vacation home as much as we do! Please email with any questions.We are here to make your getaway a great one. Remember No Smoking and 4-Wheel Drive Recommended in Winter Months. Keywords: Cabin - House - Private location. 2 bedrooms. We purchased this home because of the location. It is private. but close enough to town. It is just beautiful at the cabin, in the best location! When we are at the cabin, we enjoy the time together as a family. Just to go outside and walk is a great pleasure. We enjoy our coffee on the log rockers on the porch watching the hummingbirds. Very nice linens are provided, along with all the bath towels and kitchen towels. Full size washer. Usually Launder detergent supplied. Plenty of bath towels and also kitchen linens. Plenty of dishes. Service for at least 12. Kitchen is well equipped with all appliances, dishes, cookware, silverware, wraps, plastics,foils, and linens. Movies for both adults and children. My husband and I really enjoyed our recent stay! Even though we were there in October we were glad we had our 4 wheel drive vehicle as it had rained a lot so back roads were muddy and some pretty good ruts in the driveway. Back roads were part of the fun for us. The cabin is outfitted with just the right stuff and is quiet. You are far enough out in the country that there wasn't any vehicle noise and yet an easy drive to get to other things to do. Penny always responded within a short period of time to any questions we had. She also gave us a couple of suggestions of places to check out which were great. Truly a peaceful place! Property is nice, house needs some “TLC”. Property is a great get away. Quiet, except for the NRA member next door. Queen bed was a bit to our disliking but it worked. Something to do with the water system in the basement kept clicking and it radiates throughout the house. Water system is leaking in the basement and should be looked. Water smells like sulphur so bring your own water to drink and cook with. Thank you for being a return guest, as we have many guests who return numerous times, they have found the cabin a great retreat. As they have shared their wonderful stays via reviews. Unfortunately, we have no control of our neighbors, who actually rarely visit their cabin, but when visiting they enjoy target practice. When there are any maintenance issues, we have our phone numbers on the refrigerator and website, and would have addressed the water system immediately. The "leakage" is actually condensation. We always keep additional water below the cabinets, if needed. The cabin is a welcoming retreat for guests, who are pet owners and or not. We always address any issues that are brought to our attention, but honestly can not remedy concerns, once guests leave. Thank you. We appreciate your input and always welcome reviews.Thank you again for visiting. From the moment we set foot into the cabin, it felt like home. Penny and Robert were very responsive, and the cabin was welcoming and clean; we could not have asked for more. While it was very secluded, it was also easy to get around, whether a hiking trip to the PA Grand Canyon or checking out the cute little town of Wellsboro (a friend told us not to miss the famous classic diner). But really, basically we stocked up on food supplies in Mansfield on the way in (don't miss the farm stands along the way), and just spent lovely evenings grilling outside and enjoying a glass of wine on the porch overlooking the woods. Nothing but quiet and nature sounds, that was what we needed for our weekend out of the big city. There are plenty of things to do around the area; the question is whether you will want to leave the cabin at all. As some of the other reviews mention, there is almost no light pollution! The weather was a bit fickle, which didn't bother us in the least (we still went for hikes and other exploration tours), but we did get lucky enough on our last evening to lay on the large lawn and stare up at the starry sky. For someone who usually sees a handful of stars in the sky at best, it was an amazing sight! Thank you, Penny and Robert, for sharing your lovely home with us. I hope we will be able to return one day. All around an incredible experience! The cabin was exactly as described and the owners were wonderful! Location is very ideal when exploring all the area has to offer. We will be back! Thank you for having us! Awesome place to unplug and recharge. We have rented this cabin twice and have loved our stay each time. It is definitely “off the beaten path” in the best way. It is well-maintained and sits on a beautiful piece of land. Plenty of stuff to do in the area in the form of hiking, biking, and many other outdoor activities. The lovely towns of Wellsboro, PA and Corning, NY are just a short drive away as well. What a beautiful, secluded, quiet, wonderful property this is. I needed to unplug from my job and my wife and I needed to unplug from our life, and we did exactly that. We took our granddaughters, 10 and 13, and had a great time. The cabin is very nice, comfortable, and everything worked as it should. There were no issues with the satellite TV or the internet service. The kids had a blast on the property. Plenty to explore and the lawn is immense. It's absolutely quiet when the air is still. No traffic or aircraft sounds. We live in a noisy environment and to be able to sit on that huge lawn and hear nothing and think nothing was remarkable. The sky was inky black at night, I hadn't seen a sky like that in a very long time. We went on day trips to enjoy the splendor that is Tioga County. The countryside is breathtaking. We went swimming in Cowanesque Lake, went to the Pine Creek Gorge, took a ride on a covered wagon on the Pine Creek Rail Trail and went to a Street Fair in Corning, NY. The kids made Smores over a fire and the old people grilled two juicy steaks on the grill. The best part for me was hearing the kids laughing as they ran around at night doing nutty kid stuff. So, a beautiful cabin, a beautiful setting, remote, silence, black skies and happy laughing grandchildren. What else is there? This vacation certainly exceeded our expectations. Thank you, Penny, for letting us stay there. There is a damage deposit of $300.00. A cleaning / trash disposal of $75.00 will be added to reservation.The security deposit is paid through VRBO and is refunded through VRBO. Thank you!